SOME MALE FOOTBALL fans in Scotland have found that visits to their favourite club helped them lose weight – and gave them a sneaky look behind the scenes. 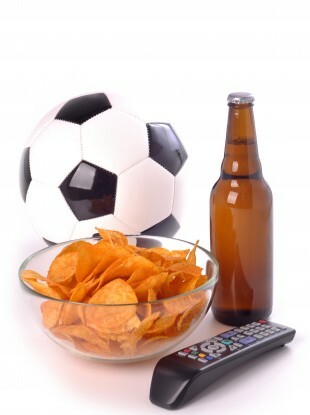 They took part in a new initiative to help male football fans lose weight, take more exercise, and improve their diet – and it has been pronounced a resounding success, according to new research published in The Lancet and BMC Public Health. The Football Fans in Training programme (FFIT) has run for three seasons at Scottish Professional Football League (SPFL) clubs. The research was led by a team at the University of Glasgow, and shows that FFIT has proved extremely popular with men. It also shows that the programme is both effective and value for money, which was demonstrated in one of the world’s first randomised control trial (RCT) of a health programme delivered through professional sports clubs. After 12 months, the difference in weight loss between men who did the programme and men in a comparison group, who did not do the programme, was 4·94kg. The study began in June 2011 and involved 747 men. The baseline measurements showed that 90 per cent of participants had a BMI (body mass index) over 30 kg/m2, which classified them as obese. I was very aware that every time I was buying a new suit, the trouser size was getting bigger and I just wanted to address it. And with FFIT having a tie with the team I’ve supported all my life, I felt that the two kind of – they fitted nicely. It meant I could do something [about my weight] and I could get a wee sneaky peek behind the scenes at the club. The men who participated in FFIT lost more than nine times as much weight as men who had not done the programme. As well as losing weight when they were on the 12-week programme, nearly 40 per cent of the men maintained a weight loss of at least 5 per cent of their original body weight a full 12 months later. This outcome is associated with lower risk of heart disease, diabetes, stroke, cancer, and other health problems. The study also found that FFIT helped men reduce their waist size, body fat and blood pressure. Participants also increased their physical activity levels, as well as improving their diets and mental wellbeing. Derek Spence, who has lost 14·9kg (2 stones and 5lbs) since starting FFIT at Hibernian FC in September 2011, said that taking part in FFIT at the Hibs club gave him more confidence. Since then, I’ve done an 18 lap run around the pitch at Easter Road for charity, I play 90 minutes of football and 5-a-side. Things I wouldn’t have looked at before now, I do now. Professor Kate Hunt, from University of Glasgow and the other principal investigator, said that weight management and dieting are often wrongly viewed as women’s issues. This means “that some men do not want to take part in existing weight management programmes”, she said. The FFIT programme shows that men are keen and able to make positive changes to their health in the right circumstances, and the football club is a great setting for weight management and other health initiatives for men. “This model has real potential for the future,” said Professor Hunt. Email “How football clubs helped male footie fans lose weight ”. Feedback on “How football clubs helped male footie fans lose weight ”.